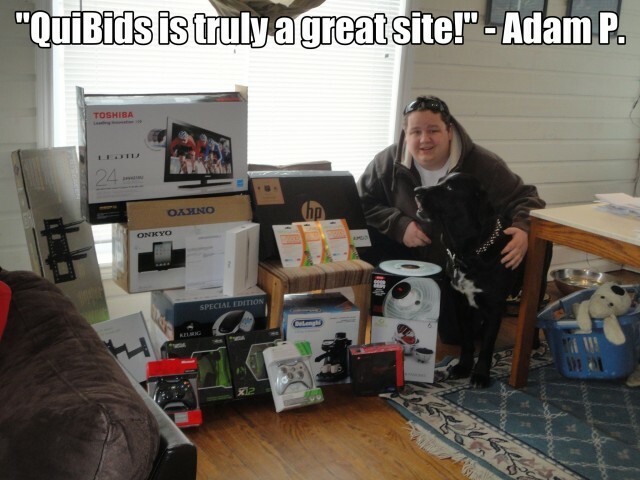 Home / QuiBidder of the Week – Adam P.
We’re happy to announce the newest QuiBidder of the Week, Adam P.! Adam was kind enough to share his QuiBids experiences with us, which we’ve published below. Continue reading to see what he has to say about his time on QuiBids – and be sure to tell him congratulations in the comments below. Do you want to share your successes on QuiBids to win a $50 gift card and to become the next QuiBidder of the Week? Go here to enter. How long have you been bidding on QuiBids? Tell us about a recent QuiBids win. Do you use Buy Now? What’s the most bids you’ve ever won from a QuiBids Gameplay? “Don’t go straight after the big items and dump bids over and over. Take you time and look at all the open items being bid on. Once you notice auctions that are heading towards 3-1 seconds left in time check those out. See how many people are bidding with around 3-1 seconds left and —if possible— let the timer go to two seconds left then throw a bid out – ONLY one bid though. Thanks again Adam for sharing your story! Adam will receive a $50 gift card for letting us share his story as QuiBidder of the Week. Feel free to congratulate him in the comments below. Do you want to tell us your QuiBids story and become the next QuiBidder of the Week and win a $50 gift card of your choice? Be sure to go here to submit your story and photo. Happy bidding! QuiBidder of the Week – Richard G.
QuiBidder of the Week – Colleen H.
QuiBidder of the Week – Susan F.
QuiBidder of the Week – Trevor A.